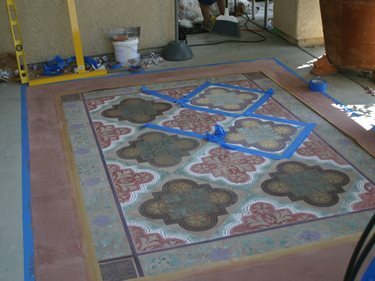 Watch an overview of how this concrete rug was created using stencils on concrete. Perhaps not as comfy as a fine oriental rug, but certainly more durable, is this concrete "carpet" created by faux finisher Kim Longo. 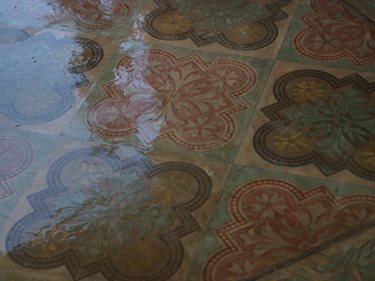 Inspired by an aged tile look she saw in villas and palazzos in Italy, Longo has used templates and trowels to create unique patterns in concrete surfaces. 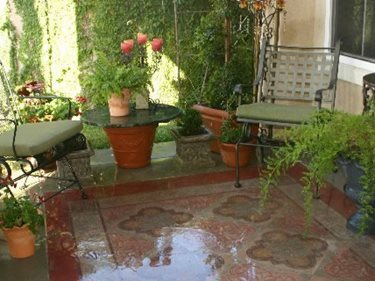 To begin this project in her own home, Longo scrubbed the existing concrete surface and applied two coats of Skimstone primer to bring the surface to the recommended surface texture. "I measured off the area where the 3 x 5-foot Modello stencil was to be placed on the concrete substrate," says Longo. "I then added a 6-inch border around the perimeter of the design to increase the carpet size without the cost of a larger template." She then drew a center line and stuck down the template, the Barcelona Concrete Carpet Modello, in two sections. "Using the smallest Japanese trowels, I selected lavender and green for the floral borders. Being wary that this design could get too busy with the introduction of too many colors, I wanted to make sure I had a unifying effect, so I started with a very light application of mocha. The beaded areas in the tile sections of the design necessitated using my fingers because of the small detail. Separating the individual tile colors required more taping after which I applied a soft toning layer of mocha over the entire 'carpet.'" The first step was to apply two primer coats. Longo taped off the templates to keep the colors separated. 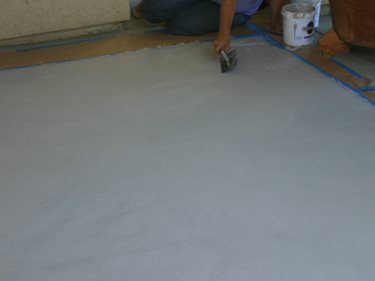 For the larger areas of the carpet, Longo used a Pavan trowel and experimented with a plastic-bladed Japanese trowel she found at a local paint store. To complete the "carpet," Longo applied three coats of Skimstone sealer before removing the edging tapes. "What began as a blank concrete canvas had been transformed into an inviting room where my youngest does his homework and reads in the afternoon with his dogs and that becomes a spot to relax at night with the ocean breezes we have here so close to the Pacific," she said. Longo got into decorative concrete and faux finishes in a roundabout way. "When my children were young, I practiced law in San Diego with my husband, eventually retiring to become involved in my children's schools, piano lessons, sports, and local community matters," she says. But 5 years ago after attending some local home shows, she began teaching herself faux finishes with videos, books, online information, and training classes. 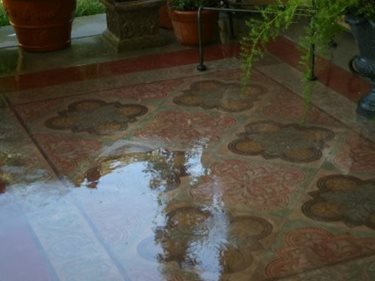 To learn decorative concrete, she took training classes from Colormaker and Skimstone. For faux finishing Longo took classes on the Reactive Series Faux Effects products which produce marble and granite effects and in using Modello templates, She learned Trompe L'oeil with Pierre Finkelstein and went to the Tania Seabock Studio to learn mosaic design and Faux Azulejo. But her new "carpet has taught her things the classes did not. "Even though I had training and experience in Modello templates, they were very basic and one dimensional. After completing this detailed carpet and color design, which took about 5 days including taping and sealer, I am much more able to estimate the time involved in a project of this type."